A very brief post to apologise for the (hopefully) brief interlude. I'm currently on holiday in sunny Florida and had uploaded photos in order to post a little morsel of something while away. However, pretty much as I boarded the plane at Heathrow, I was struck down with some absolutely horrible bug which I have yet to shift. As the evil bug still has its hold, I can't face so much as a piece of toast and so even looking at the photos is just too much. I shall be returning to normal service as soon as I can face a slice of the Key Lime Pie I travelled all this way to enjoy! 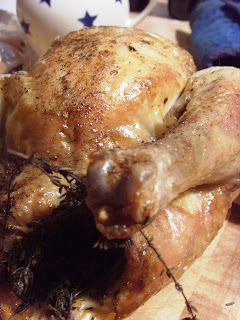 Is anything better than roast chicken? Well I'm finally back from my stateside trip. It was somewhat dampened by a nasty bug but I recovered enough to enjoy some Floridian Key Lime Pie and indulge in all sorts of goodies over a long weekend in NYC. Details to come later this week! No matter how good the food on holiday, I always love to return to my kitchen and look forward to some thoroughly British grub - last night's return supper was my favourite fish pie. Wonderfully comforting. When asked to name my favourite British food I'm always torn. There are so many British classics that I adore. However, one thing just pips all other comforting goodies to the post and that has to be a classic roast with all the trimmings. Next problem of course is to decide which meat I love best. Initially I think of roast beef with Yorkshire puddings. Then I think about how I adore a leg of Welsh lamb. Both are real treats which I adore. 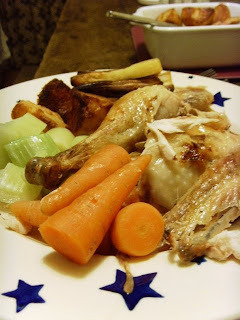 But for pure comfort, I actually think that a good roast chicken might top the list. 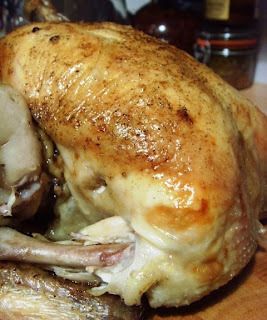 It might sound dull but there is something simple yet utterly irresistible about a perfectly-roasted bird. Just before I left for my holiday, I was lucky enough to receive a chicken from the folks at Abel and Cole. Hang on a minute, I hear you say. Aren't they the organic veg box people? Indeed they are. And their fruit and veg boxes are superb. To be honest I've never ventured beyond the fruit and veg section of their website but a closer inspection reveals a whole world of other produce which they deliver straight to your door. Organic meat, baked goods, dairy and fish are all available. And the prices are much better than I expected too. But let me tell you about this lovely free range chicken. It is no ordinary bird. This free-range chicken is (wait for it) 'rainforest friendly'. Confused? I was. I wasn't aware that the chickens I'd been buying were rainforest unfriendly. Apparently so. It is all to do with soya which is used in regular chicken feed. Soya is a major contributing factor to deforestation. You can read more about it here. All very interesting, but is the chicken any good, I hear you ask? This environmentally-friendly chook is reared by Devon farmers who are passionate about the project. The chickens are not organic but Abel and Cole consider them to be the next best thing - ideal if stretching to an organic bird each week is just a bit too tough on the bank balance. This was a delicious bird, I have to tell you. 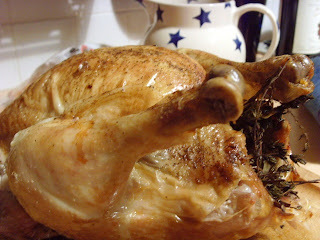 It remained beautifully juicy as it cooked and had a great, properly chickeny flavour. Too many standard chickens taste of nothing. I pretty much always roast my chicken the same way. 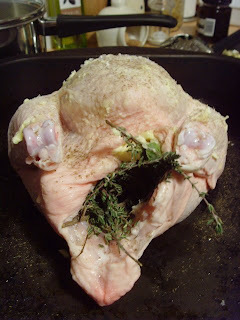 I stuff it with half a lemon, a few onion wedges, fresh thyme and a bayleaf. I then rub a touch of softened butter over the skin and season well with salt and pepper. Sometimes I pour a glass of white wine into the roasting tin to help the gravy along. 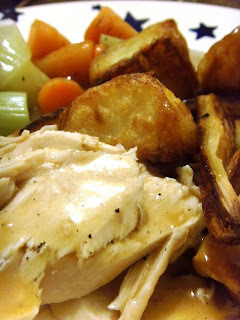 Roast potatoes are a must (few things disappoint me more than roast chicken served with mash or new potatoes). Goose fat is great but I don't HAVE to have it. On this occasion plain old olive oil and King Edward potatoes worked a treat. Roast parsnips usually get my vote, as do leeks and peas. I'm a creature of habit when it comes to roast chicken. How do you like yours? Sadly, it was rather late by the time my bird emerged from the oven all golden and lovely. The photos don't even begin to do it justice - you'll just have to imagine the mouthwatering herby smell! I apologise for the lack of Valentine's Day greetings. 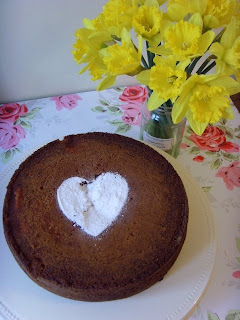 Last year I did at least oblige with a heart-shaped mousse, even though it was through gritted teeth due to my rather negative feelings about February 14th. It is after all, the day most dreaded by single women. This year things took rather an about turn. Rather than feeling sorry for myself and bristling at the sight of heart shaped goodies invading the usually sane food blogosphere I actually found myself feeling a little more positive about the whole experience. It started with the large bunch of roses that arrived on Friday. But the flower-sender didn't stop there. The flower-sender then took it upon himself to cook dinner for me on 'the big day'. So essentially, I was thoroughly spoiled. I'm not entirely sure what I did to deserve such special treatment but it was certainly rather lovely to sit back with a glass of Champagne whilst someone else did all the work. This explains the total lack of Valentine posting: I was too busy drinking Champagne. Sorry. So. No heart-shaped goodies from me. Instead, I offer you treacle tart. As regular readers will know, I'm pretty partial to traditional British puds. 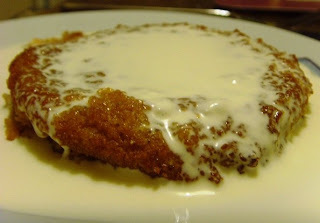 Treacle tart is a total favourite and I will always order it if I spy it on a menu. Invariably I am disappointed though. I'm a little particular about how I like my treacle tart. I like it fairly lemony. 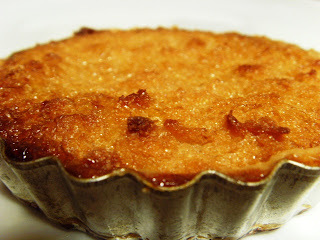 I like a little citrus bite to balance the intense sweetness that lashings of golden syrup brings to the tart. I haven't provided a pastry recipe here. Use your favourite type - it should be nice and short, possibly with some sweetness or perhaps flavoured with some nuts or ginger. If you can't be bothered, I won't tell anyone if you use a block of readymade from the chiller cabinet at your supermarket. On this occasion I made my tarts in individual tins, but a big one works just as well! 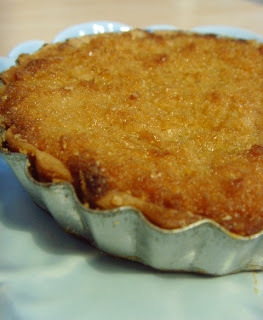 By the way - if anyone can tell me why it is called 'treacle tart' when it is made with golden syrup, I'd love to know! 1. Preheat oven to 190C. 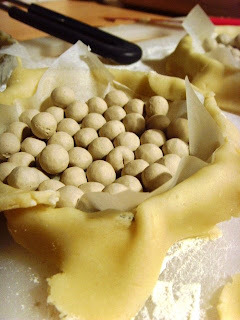 Roll out the pastry and line an 8 inch loose bottomed fluted flan tin (or use individual tins). Leave a little pastry overhanging the edge to allow for shrinkage. Blind bake the pastry case, having filled with greaseproof paper and baking beans. Trim excess pastry. 2. For the filling, heat syrup and butter over a low heat. Add the juice and finely grated zest of the lemon and stir to combine until you have a nice lemony syrup. 3. 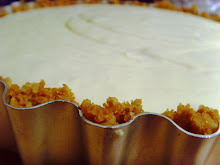 Spoon breadcrumbs into the pastry case and pour over the lemon syrup. Bake for 25 minutes, or until filling is set. Leave to cool a little before serving - I like it best when warm but not hot. 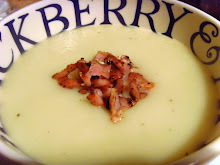 Serve with ice-cream, cream, custard or even clotted cream. As you can see, my friend had a slight... slippage... with the cream. Another busy week with very little time spent in the kitchen. Travelling with work at the beginning of the week, being cooked for on Wednesday and eating out with a friend last night has meant that there has been something of a dearth of food coming out of the Food, Glorious Food kitchen. Last week was a different matter, however. 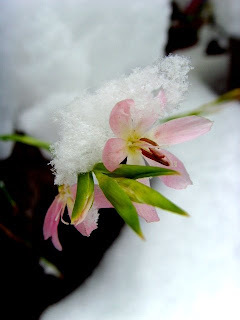 With snowy conditions keeping me very much indoors, I spent lots of time pottering at home. As it was even too icy to consider venturing out to the shops, I was pretty much reliant on the contents of my cupboards. Good job that they were reasonably well stocked really. Making the most of dry goods and canned foods took me back to being a student. In those days (not so long ago, I'll have you know), I was pretty content provided I had tinned tuna and tomatoes in the cupboard, fish fingers in the freezer and bread in the bread bin. Actually, don't tell anyone, but I'm still rather fond of a fish finger sandwich. 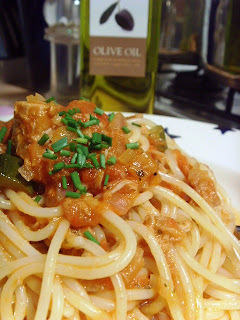 One of my staple suppers at university was this tuna pasta dish - I pretty much always had the ingredients to hand, it is very cheap and pretty tasty. There are better pasta dishes in this world sure. But when you have two feet of snow outside and you are desperate for food, this pretty much hits the spot. I'm not going to give a full recipe. The point of this dish is that you make it with whatever you happen to have in the house. I've done it with sardines before now. And (again, please don't tell anyone), I've been known to grate over a handful of Cheddar in place of Parmesan. 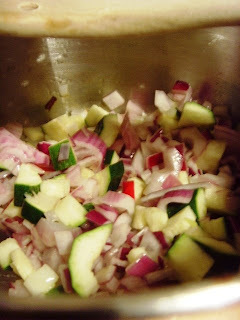 Sweat an onion, along with some garlic and any other hard veg you might happen to have lying around (I happened to have a rogue courgette). 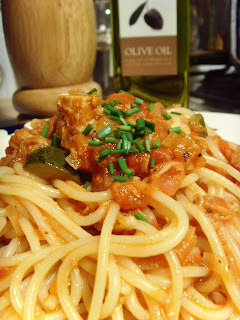 Add a tin of chopped tomatoes and a tin of tuna and give a good stir. Add a pinch of dried herbs, a small pinch of chilli flakes and a generous pinch of sugar. Stir. Pour over a little vegetable stock and leave to simmer for around 20 minutes, topping up with stock if it reduces too far. Taste and adjust seasoning. Meanwhile, cook pasta according to pack instructions. Drain and stir into the hot sauce. Serve with some grated Parmesan (if that tickles your fancy) and chopped fresh herbs if you have them (I had a few chives). 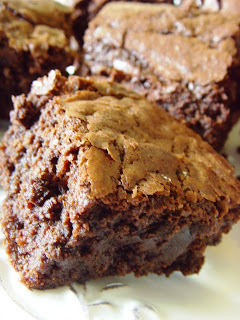 Warning: these brownies are not for the faint-hearted. Don't believe me? 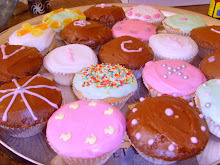 Well, let me tell you that even I struggled to eat a whole one of these babies. And I'm a serious chocolate/sugar junkie. They are rich. Mighty rich. And they are sweet. Mighty sweet. But oh are they good. I've all but given up in my quest for brownie perfection. I have never succeeded in getting them just right. The crackly top and the slightly chewy interior. Mine are almost always under-cooked. And not in a good way. Yet I'm afraid of over-cooking them and ending up with something too... cakey. Strangely, I also find most recipes are just a bit too... chocolatey... for my taste. Just a bit too intense. I think perhaps I should consider using (shock, horror) a slightly lower cocoa percentage chocolate. You might think this a controversial move. But interestingly, I was talking with an award-winning chocolatier recently (as you do) and he said he felt that people had gone rather over-the-top in their insistence that 'the higher the better' when it comes to cocoa solids. For him, it is all about balance. It is kind of like wine really. A higher alcohol wine is only any good if the flavour, tannin and acidity are able to carry the high alcohol - balance is what we are after. I'm not sure I'm explaining myself well... Anyway - his point was that a slightly lower cocoa solid content chocolate can still be of excellent quality. No doubt there are lots of experts who would totally disagree with this - I'm just telling you what this man told me. And let me tell you, his chocolates were out of this world! 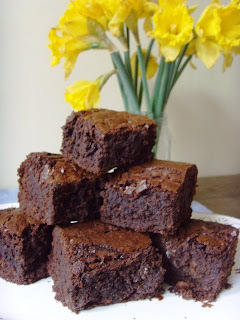 Anyway, this is all rather pointless seeing as these brownies were made with a 70% cocoa solid chocolate. And they are exceptionally rich, intense and full-on! But. Oh. My. Lord. These are good. 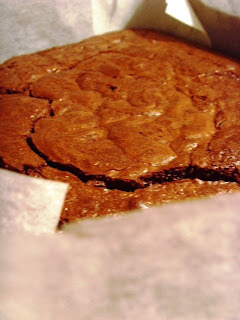 They are not what I'm looking for in my 'perfect brownie'. They are something altogether different. But they are pretty damn good. They taste a bit like how sticky toffee pudding would taste if it were made with chocolate rather than dates! They have a treacley-like flavour to them I suppose. Now that I study the recipe in more detail, I see that it actually suggests that you use chocolate with 50-60% cocoa solids. I will do this next time. Perhaps then I'll be able to manage more than half a square at a time. 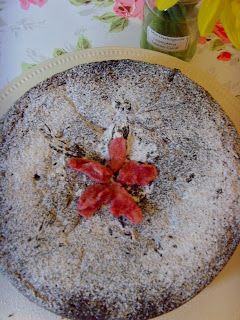 The recipe is from one of those natty little books of BBC Good Food origin - 101 Cakes and Bakes. It is a great little book that I heartily recommend. 1. Preheat the oven to 160C. Butter and line the base of a nine inch cake tin and set to one side. 2. Take a heavy-based saucepan and set over a low heat - melt together the chocolate and butter, stirring once in a while to stop it sticking. Once melted, stir well and set to one side to cool somewhat. 3. Whisk the eggs until pale and then whisk in the sugar until thick, glossy and completly combined. 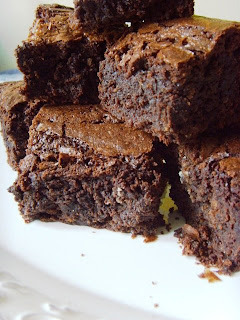 Now fold in the cooled chocolate mixture and finally sift in the flour and baking powder and stir until all is combined and you have a smooth batter. 4. Pour and scrape into the prepared tin and bake for around 35 minutes. It should be just firm to the touch but the middle will still be soft in the centre - it will firm up on cooling. 5. Cool in the rin on a wire rack for at least an hour before cutting into 16 squares, removing from tin and continuing to cool on the rack. 6. Serve, perhaps as dessert with a little cream to cut the richness! I have to say that I honestly never thought that I'd be snowed in whilst living in London. Ok. Well, perhaps I'm exaggerating just a wee bit. But there was a huge pile of snow blocking the front door when I ventured out today. And with no buses running, the two hour journey to work was a non-starter. I'm told that London hasn't seen snow like this for 18 years and I can well believe it. This is the snow of my childhood. Proper snow. 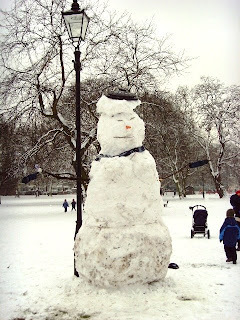 Snow you can build proper snowmen out of. Sometimes I think I've had enough of living in London. But today, it was magical. I took a brief walk out onto the Common this afternoon and it was great to see so many people enjoying the simple fact that it was snowing. I must have counted at least 150 snowmen. Well. Ok. Maybe I wasn't actually counting. 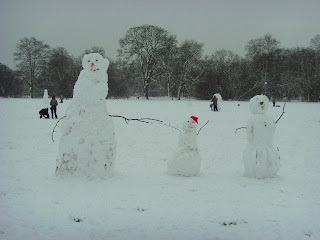 But there were a lot of snowmen there. A lot. I know it is pathetic that the country grinds to a halt when there is a bit of snow. But we're not used to it. Our cars aren't designed for ploughing through snow. Our clothes aren't thick enough to keep us warm. Our footwear is totally inappropriate. We just don't get to see proper snow all that often. Forgive us if we all regress to the age of five and come over all a little silly. (Sadly), I can do my job almost as easily from home so I didn't have much of a chance to get out and be silly (...probably for the best). But I did have a couple of hours to kill this morning before I was able to log on to the work system. I'd got up at the usual time of six and for some reason felt wide-awake (never happens on the days I actually have to set off at that time). So rather than head back to bed for a bit and wait for my new password to be phoned through from the office at nine, I decided to bake a cake. You know, as you do, at six in the morning! 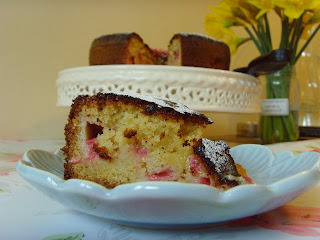 I had some lovely pink early forced rhubarb begging to be used. I searched in the cupboards for other store cupboard ingredients to add to my cake and became rather fixated on a packet of marzipan left over from Christmas. For some reason I couldn't get it out of my mind. 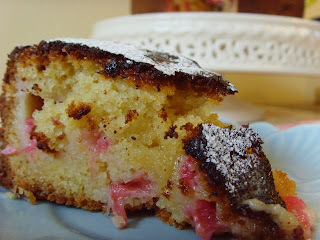 I had this burning desire to make a rhubarb and marzipan cake (...this is what happens when you decide to bake at 6am). I googled. Clearly I was in the minority. 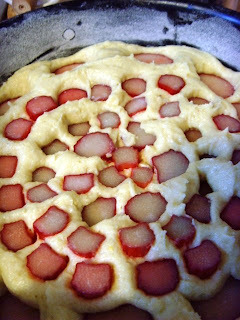 Not many 'rhubarb marizpan cakes' out there. But one was all I needed. I had no idea if it would be any good, but I decided to give it a whirl. 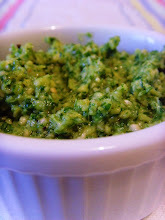 I had to tweak the ingredients ever-so-slightly but I have to tell you that the results were pretty delicious! A few things to tell you before you embark on this cake (and clearly, you should do just that. Unless you hate marzipan. 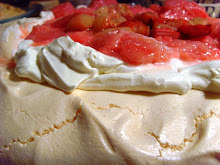 Or rhubarb for that matter. But then, maybe it is time to push the boundaries). 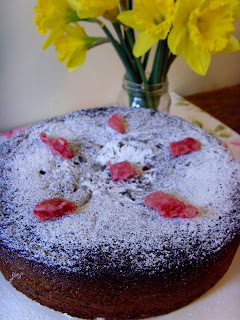 Firstly, the recipe suggests putting the rhubarb in vertically, creating lovely round patterns. Good idea. Only you couldn't see the pattern once it had been cooked. Maybe that's because I burnt the top... Or maybe my bits of rhubarb should have been longer! Next thing. As you will see, I kind of slightly burnt the top of my cake. And it sunk a little in the middle as it hadn't quite cooked in the centre. Perhaps the oven was too hot? Still, no problem. A quick dredge of icing sugar and it was instantly disguised. Alternatively, there is the cunning 'turn it over' trick. Again, no one is any the wiser. Apart from you, that is. As for decoration, this is a plain, un-iced cake. I suddenly thought that it might make a nice Valentine cake. I cut a stencil out of a sheet of white paper and then dusted icing sugar through the hole. Quite pretty I thought. 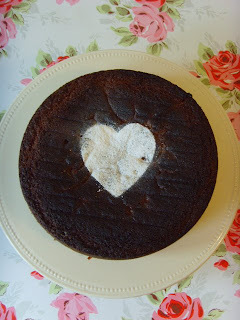 But then, due to my feelings about Valentine's Day, I decided that the heart would have to go and instead I dredged the lot with a sprinkling of icing sugar and then added some crystallised rose petals. Pretty and springlike I thought! However you choose to decorate, let me tell you that this is a good cake. Densely almondy with a good balance of sweetness from the marzipan and sugar and bite from the tart rhubarb. It would make a perfect dessert with a little cream too. 1. Pre-heat oven to 200C. Grease and flour and 8 inch spring form cake tin. 2. In a food processor, cream together the butter, marzipan and sugar. You may have to do a fair bit of scraping and separating as it sticks together rather badly. Add the vanilla and lemon and blitz together. 3. Add the eggs one at a time. Mix the flour with the baking powder and add this, mixing together gently (on slowest setting), until fully combined. 4. Scrape the cake mixture into the prepared tin and arrange the chopped rhubarb in circles (see note above). 5. Bake in the oven for around 45 minutes, until a skewer comes out clean. Cool for five minutes in the tin before turning out onto a wire rack to cool completely. Decorate in any way you see fit (see earlier suggestions). Welcome to my collection of food-inspired ramblings and musings, recipe ideas and restaurant reviews, wine tips and general gourmet banter. Enjoy your stay! 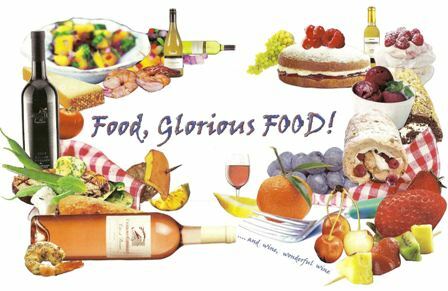 Good food and wine are my greatest indulgence. I am never happier than when pottering in the kitchen, cooking up a storm for a crowd. Food shopping excites me more than clothes shopping. I take cookery books to bed. I dream about freshly-caught mackerel. I hang out at farmers' markets. I think you're getting the picture. Writing and photography copyright Antonia Lloyd © 2010, 2009, 2008, 2007 unless otherwise indicated.You may not copy or otherwise reproduce any of this material without prior written permission. All rights reserved.